The Casimir PhD position 2016 is awarded to Eduardo Pavinato Olimpio. 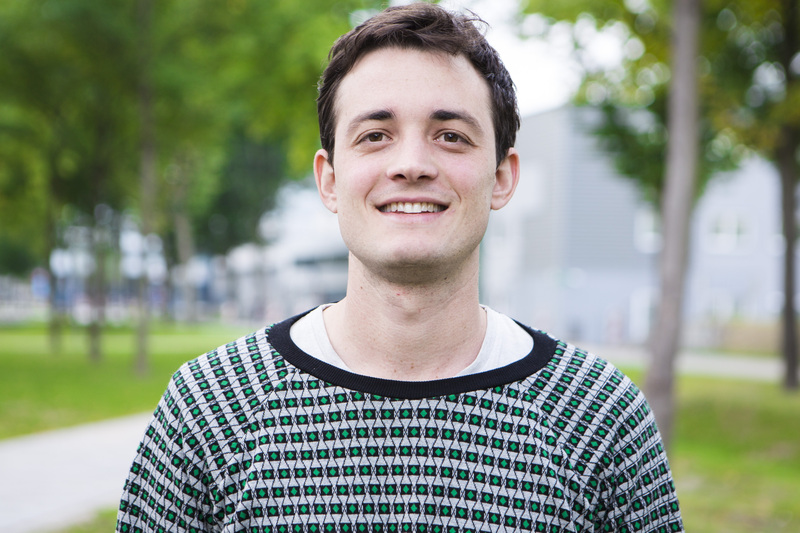 Last month, Eduardo, a former student of the Casimir Pre-PhD track, successfully defended his research proposal that was entitled 'Statistical physics of multicellular networks' during an interview with the Casimir PhD position jury. This year's jury members were Liedewij Laan (Delft/BN), Leo DiCarlo (Delft/QN) and Jan van Ruitenbeek (Leiden, chairman). The jury was impressed by the quality of Eduardo's project proposal and his ability to counter the jury's critique during the interview. Eduardo Olimpio (Itapira, Brazil, 1987) finished his master's degree in August 2016 with an 8.9 average. His effort did not go unnoticed: after the his first MSc year, he received the Hendrik Casimir Prize. In the four years to come, Eduardo will work at the Delft Bionanoscience department under the supervision of Hyun Youk. Eduardo is very much looking forward to it. When he was asked why he is pursuing a PhD in Quantitative Biology, Eduardo responded: "The field is on its inception, allowing scientists to ask simple, and sometimes naïve, questions. It is also possible to perform relevant work both in theory and experiment, combining the experience of developing new models and testing them. Not many topics in science allow for such a combination during a PhD. On top of that, I just find doing science fun. I like the routine of solving puzzles (and struggle with them) and think about my problems in a way that no other person have thought before. I enjoy working in the lab pipetting up and down and taking measurements. I like the academics environment and the interpersonal relationship with senior scientists and other students, older and younger. Moreover, in the same way I got inspired by other scientists during my life, I want to be an inspiration to others in my career by both doing research and teaching." The Casimir PhD positions are funded through the NWO-Gravitation program ‘NanoFront.’ Casimir PhD positions are awarded to outstanding students of the Casimir Pre-PhD track. Between 2011 and 2015, the following eleven alumni of the track received a Casimir PhD position: Tim Baart (now researcher at Shell), Julia Cramer, Chris Smiet, Jelmer Wagenaar, Misha Klein, Tom van der Reep, Henk Snijders, Marios Kounalakis, Guoji Zheng, Joeri de Bruijckere, and Michiel Bakker (Michiel decided later to accept a PhD position at MIT). The Casimir Pre-PhD track focuses on preparing MSc. students for a PhD position, either at Leiden, Delft or elsewhere. You can read more about the Casimir Pre-PhD track here.